Mmm! Delicious frozen strawberries and cream popsicles! 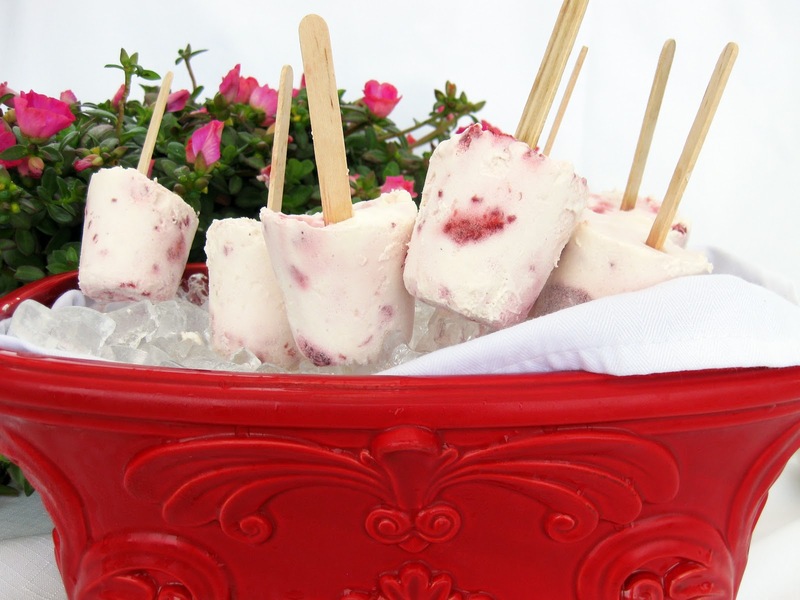 These "Berries & Cream" popsicles are a quick and easy dessert to prepare, and can be made with any type of berry. They're not as sweet as the Cookies and Cream Popsicle Recipe I made recently, but are bursting with flavor. In this recipe, I used homemade whipped cream for the base and added sour cream to give it a tangy bite (compared to Cool Whip and cream cheese called for in the Cookies and Cream Popsicle Recipe). 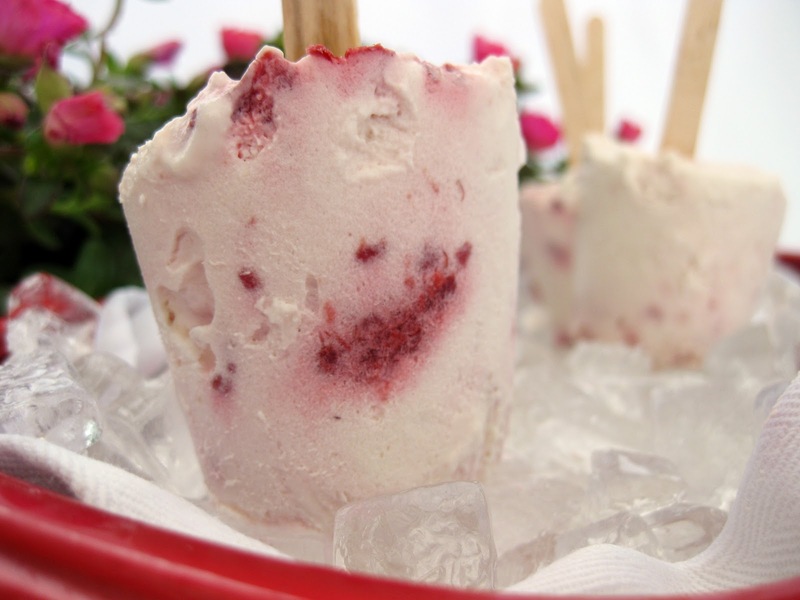 You can substitute the strawberries for raspberries to get raspberries and cream pops. 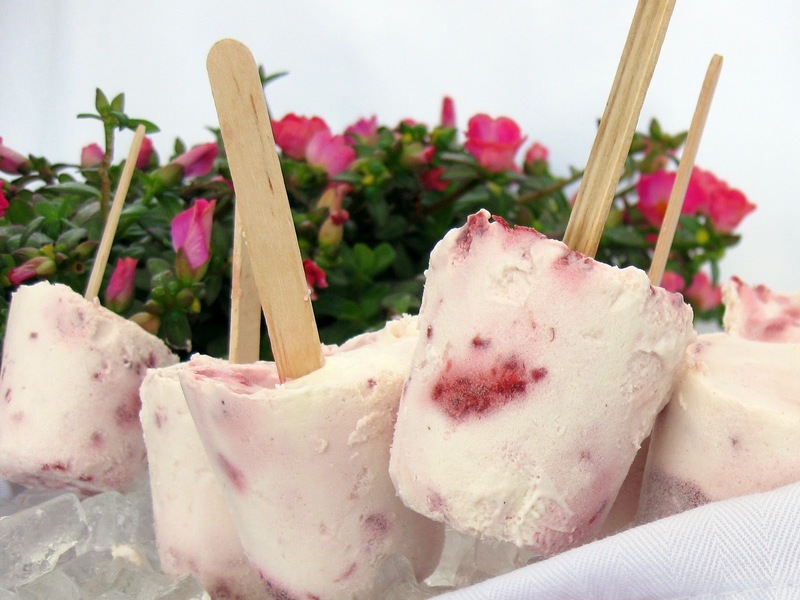 This frozen strawberry dessert recipe makes delicious creamy berry pops. Brutal honesty: I liked the Cookies and Cream Popsicles better. I think the creamy base was smoother, tastier and sweeter. My hunch is that homemade whipped cream does not freeze as smoothly as Cool Whip does. The next time I'm faced with hot weather, I'll have to whip up another batch of these cream pops using the Cool Whip base from the Cookies & Cream Popsicle recipe. I think it will result in a creamy popsicle with a smoother texture. More easy and delicious desserts! Exciting! It's a quick and easy dessert recipe that's perfect for a hot day. In other exciting news, I just got some land to plant a garden on (about 10 feet by 17 feet). It's getting cold out, but no worries - I planted some cold-weather vegetable seeds. Let's hope they grow into something before frost hits! Send optimism/heating lamps my way, please. Berries and cream come together in this easy popsicle recipe. 1.5 cups strawberries or other berries (either fresh berries that you've mashed a bit, or frozen berries). In a large bowl, beat the sour cream until soft. Add the whipping cream, vanilla, and sugar and beat on high with an electric mixer until soft peaks form. Fold in the berries (I used frozen sweetened strawberries in syrup in one batch and frozen raspberries in another). Because berries vary in sweetness, and some frozen berries may or may not have added sugar, the batter may benefit from more sweetness; Give it a little taste and add more powdered sugar as needed. Pour/spoon into paper cups and add the popsicle sticks. Freeze the berries and cream pops for at least 4 hours, or until firm. 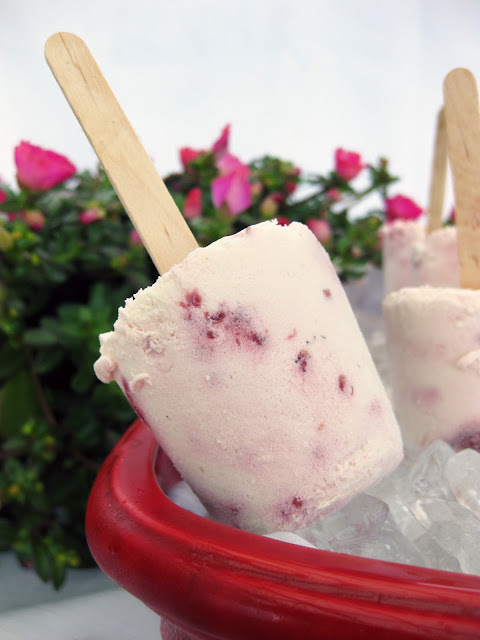 OR if you want a base that is even thicker and sweeter and freezes into a soft solid, you can use the "cream" recipe from Cookies and Cream Popsicles - I haven't tried it with berries, but I have a hunch that it will be tasty. 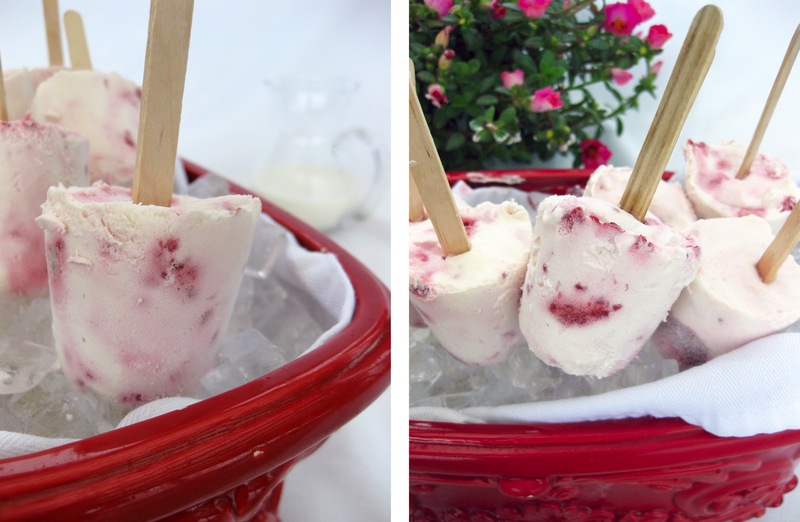 Berries and cream pops make a delicious frozen strawberry dessert. Fall is here now, so no more popsicles! these tasty deserts were amazing!!! expecially for in the summer on a hot sunny day!